Lock in a great price for Holiday Inn Express Hotel & Suites Alamosa – rated 8.5 by recent guests! Always clean..breakfast was good. Staff was awesome, kind and courteous..thank you! The food was delicious!!! Best little cinnamon buns and fresh eggs and sausage! The only thing better was the staff. Never met nicer people in my life!!!!!!!! The set up of the hotel.The nice local location.Well maintain & clean grounds. The service and quality was what you expect at Holiday inn, have not ever had a bad stay at one. The staff was incredibly friendly and helpful, and the beds oh-so-comfortable! We had a suite and were delighted at the amount of space. The rest of the hotel was just very bright, clean, and also spacious. And yes -- the breakfast was very healthy with lots of protein. We had to leave early in the morning to go view the Sandhill Cranes down, so a good breakfast was essential to us. Perfect! Ckean,helpful staff, breakfast manager super nice and efficient, will use again when in aera. We had a problem with the first room they gave us but the front desk staff worked quickly and cheerfully to get us a another (better) room in no time at all and at no extra charge. The complementary breakfast looked delicious but we were in a hurry and didn't get to try it. I love Holiday Inn Express. 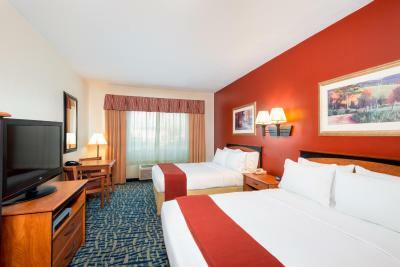 No matter where you are traveling, if you stay at a Holiday Inn Express you are pretty much guaranteed to have a clean room with all of the essentials at a great price. We stayed at this hotel in Alamosa after a long and tiring day of exploring the amazing Great Sand Dunes National Park. Coming "home" to the friendly staff, a pleasant hotel room, and comfy bed was just what we needed. I would highly recommend this hotel if you ever happen to be in the area. Also- the complimentary breakfast had it all and even provided to go bags for those of us who have to eat on the road. Service was excellent, staff was very friendly and helpful, comfortable beds and it was quiet. The entire staff, from check-in to room service to breakfast staff to check out, was consistently courteous, friendly, and helpful. No matter what we were doing anywhere in the hotel, the staff either greeted us or asked if they could be of assistance. Holiday Inn Express Hotel & Suites Alamosa This rating is a reflection of how the property compares to the industry standard when it comes to price, facilities and services available. It's based on a self-evaluation by the property. Use this rating to help choose your stay! Offering free Wi-Fi, each room is styled in crisp white linens, coffee-making facilities and free toiletries in the private bathroom. Select room features a spa bath. A business center and dry cleaning services are also offered at Alamosa Holiday Inn Express Hotel & Suites. Denver International Airport is 4 hour's drive from Holiday Inn Express Hotel & Suites Alamosa. The entrance to Rocky Mountain National Park is 273 mi away. When would you like to stay at Holiday Inn Express Hotel & Suites Alamosa? Featuring a spa tub, this room provides free Wi-Fi, crisp white linens, coffee-making facilities and free toiletries in the private bathroom. Featuring free Wi-Fi, this suite is decorated in crisp white linens and includes coffee-making facilities and free toiletries in the private bathroom. The Holiday Inn Express and Suites of Alamosa is the ONLY place to stay when in Alamosa, Colorado. Voted #1 in Customer Service - 4 years in a row. FREE 16 item HOT breakfast buffet 630-930am each morning. Hotel has the most spacious rooms- refrigerator-microwave- 35" LCD Flat screen TV's- hairdryers- iron and ironing boards..all FREE. Luxury bedding, Stay Smart Showers 1 mile from Adams State University and 30 minutes from the Great Sand Dunes Nat'l monument. 30 minutes to the Rio Grande Scenic RR. House Rules Holiday Inn Express Hotel & Suites Alamosa takes special requests – add in the next step! Holiday Inn Express Hotel &amp; Suites Alamosa accepts these cards and reserves the right to temporarily hold an amount prior to arrival. Holiday Inn Express Hotel & Suites Alamosa accepts these cards and reserves the right to temporarily hold an amount prior to arrival. Fridge in the room didn't seem very cool..halls seemed noisy..realized their were high school students afterwards, so it made sense. Mold on bagel and english muffin was stale, I just threw them out and choose something else. Because of the nearby highway our room was very loud fro traffic noise. Because I didn’t book using my IHG reward number we not treated very well upon arrival. Bed mattress needs to be replaced; Keurig coffee machine was out of order, bed lights didn’t turn on, fan in bathroom was noisy. Hotel is 20 feet from US 285, lots of truck noise. Staff were great; dining room was pleasant.